I skated out of painting the new Minotaur chapter icon when I posted this Minotaur Space Marine model I painted a few months back. After getting a few requests on how to paint the actual chapter symbol and not the shortcuts I did, I thought I might give it a go to see just how hard it would be to duplicate in freehand. My initial impression was that it would be fairly easy to do and I was close. It's not hard to do once you know how to break it down into shapes, it's just keeping track of a few key spots in order to get the right feeling to the iconography. I sat down and sketched it out a couple times until I knew I had a workable process that I could reproduce with my paintbrush on an actual model. Not that it would be super easy, but it was doable. I decided I would be adding this (my freehand work) at the end of my painting in order to keep the overall model painting time down to a minimum. You can do your freehand before or after you paint your model, each has it's pros and cons and it's worth considering both methods. 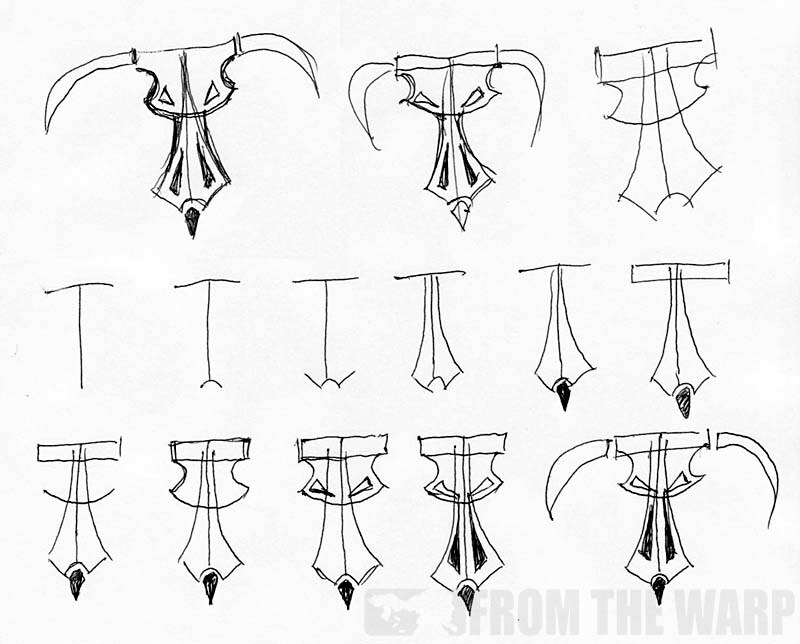 I discuss that very thing in this post on when to do your freehand work. I started out by painting up a shoulderpad in the bronze/gold look the models would have so I could see how the final freehand would look over the real basecolor. I used the same method I did on my previous model. It does me no good to paint it on something grey only to find out it (the colors I chose) don't really work that well over a bronze metallic basecoat later on. This way, I could modify either part so the end result was what I was looking for. And I hit the very problem I anticipated. Trying to get this detailed of an image to look good over a metallic color is near impossible for me. What I needed to do was repaint my base color as a light brown in order to make the icon stand out. The background color needs to be a flat color or better yet, non-metallic metal for this icon to work the best I think. That can add considerable time to painting your models and slows everything down. NMM is not something you're going to crank out quickly nor is it something I want to do on a few dozen shoulderpads. Once I had it (my shoulderpad) repainted with my tan instead of bronze, it was a matter of following the steps I came up with and "building" the overall shape of the minotaur head. Note I said build it and not try to draw it outright in one pass. By building it from smaller shapes, I'm able to reproduce it consistently each time I go to do it. The few areas I found I had to watch out for were the length of the nose compared to the width of the top of the head. You don't want him to have too short of a nose so you need to make sure the top of the head is the correct width in relation to the icon's height overall. Another problem is the amount fine line work on the image overall. This is not simply a blood drop or a simple tactical squad arrow. Painting this icon will try your patience to say the least. I ended up breaking out my fine tipped drawing pen to help with some of the line work. My brush could do it, but the more I worked on the image, the more I found myself looking for alternatives to painting... like not doing it at all. You certainly can paint your Minotaurs chapter symbol onto every shoulderpad. I'm not ever going do it though. I'd paint it onto my vehicles where I had a larger area to work on and my linework did not have to be absolutely perfect. When it comes to troop shoulderpads though, it's decals (which I don't do that often myself) or most likely casting. I think casting is the route I'd go if I were doing this for my army. I could sit down and sculpt one icon with all the detail and then be able to make as many as I needed. This in turn would make the painting so much easier too. Casting shoulderpads is not tough. The hardest part to doing it is getting the master sculpt of what you want. And you can always commission someone to do one master shoulderpad for you. Check out the two part shoulderpad mold making and casting series here. I'd even go so far as to say that you could paint the icon normally over a regular metallic background as long as it was sculpted onto the surface. The added texture would help it stand out and the use of a wash or two around the edges would help make it pop out as well. So there you have it. Don't try and freehand this icon (especially if you have lots of them to do and by that, I mean more than one) unless it's large and on a vehicle. For troops, it's decals or casting. And if I went the casting route, I'd make my own larger sized, low relief icons for my vehicles too in order to add some texture to the flat surfaces. In fact, I'm going to sculpt one and paint it up to see how it turns out. I'll post the results later this week. Somewhatdamaged: A very good option indeed. This can become a bit expensive though I suspect if you have a large number of models to outfit. Marcin: I never thought about that angle. Ben: Not that FW prices aren't redonkulous, but that treads a very fine line of legality, especially for a relatively public figure like Ron. If you'd go the casting route, you'd be better off sculpting a handful yourself and casting them that way, just to avoid trouble. Speaking of which; Ron, need any custom shoulder pads or bits cast? I just got my set up and I'm dying to pour some resin. Very cool, Ron! I'm about to launch into free-hand painting a whole mess of heresy-era World Eater shoulder pads, and have been thinking about how to go about breaking it down into easily paintable sections. Timely article as always - keep up the great work! 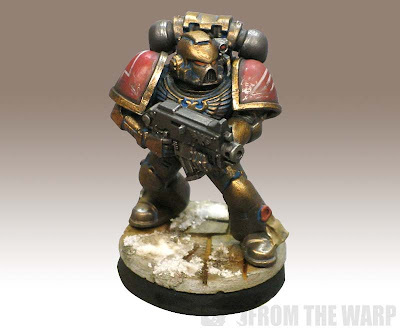 I know it would take quite a bit of extra work, but wouldn't it also be possible to do the freehand on the shoulderpad first and then adding the metallics around it? This would allow for a suitable undercoat for the freehand work as well as some extra contract between it and the metallics surrounding it. Ben: We shall not speak of those things for fear of the Inquisition. But yes, that too is an option. Myles: I may actually, I'm torn between using old school termie shoulderpads and the current style on my Novamarines. The current style would require me to mold and cast the icon in place for the best results. 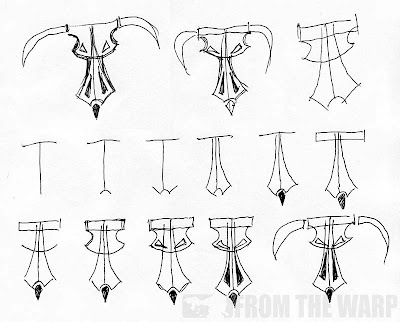 Mordian7th: Now I'm curious what that logo looks like and how I'd break it down into something manageable. I'd love to see how you get on with it. Hephesto: Absolutely. Time consuming though and I'm looking for that blend of speed and quality. I've sculpted a pad and painted it and the difference is night and day. As soon as I get everything put together, I'll post my results. Probably this Friday. Nuke Arts: I use it all the time on banners to blackline between colors and help define shapes. 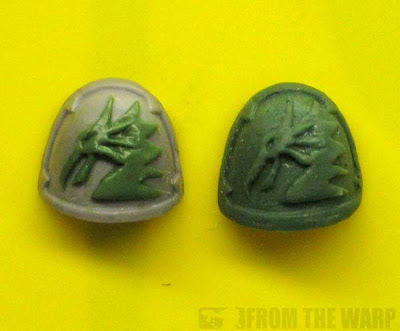 There are also plans for individual sets of heads, so these may be perfect for Veterans Sergeants and/or Veterans. I'd definitely like to see one of those heads on a Chaplain! Hephesto: I'd seen those but missed the bull head. That would make for an interesting conversion.